Cosmetic dentistry offers a wide range of treatment options to improve the appearance of your smile. Our highly experienced team can offer solutions to crooked, chipped, worn or discoloured teeth, as well as more serious cases of disease or damage. We provide the full range of dental treatments to enhance your teeth and smile including: composite bonding, porcelain veneers, crowns, tooth-coloured fillings, teeth straightening, orthodontic treatment, invisible braces, gum reshaping, dental implants for missing teeth and, of course, we have the expertise to handle more complex problems that require an inter-disciplinary approach. You can always be sure that you will get the highest quality of care. We’re committed to providing treatment that is carried out with the highest level of precision, quality and skill. 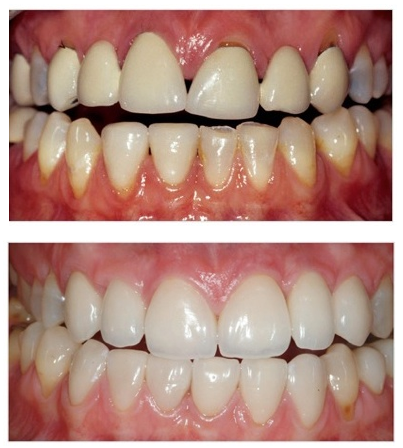 The result will be a beautiful, natural smile with healthy teeth and gums for years to come! Cosmetic dentistry has become increasingly popular in recent years. A beautiful smile with healthy gums and teeth is something we all desire and it’s what our dental practice strives to provide for all our patients. But cosmetic dentistry is not just about the latest fad in smile makeovers! To ensure the continued health and beauty of your smile, you need to be sure that the advice you receive is in your best personal interest. In other words, you need to understand the different cosmetic treatment options available and the advantages and disadvantages of each. Our goal is to provide you with just that, and we will not be afraid to advise you against any procedures that we feel are not in your best interest. As a rule, we always seek the most conservative solution to achieving a beautiful smile so that we maintain the health and integrity of your teeth.